Variegated weigela is one of the most popular shrubs these days because of its hardiness and carefree nature. These characteristics make it an ideal shrub for beginner gardeners. Variegated weigela is very easy to care for. We recommend watering the plant regularly and otherwise not to disturb it. This makes weigela an ideal shrub not only for beginners, but for any gardener who wants good-looking shrubbery but can’t find a whole lot of extra time to devote to caring for their plants. 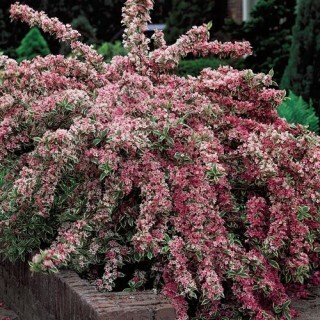 Variegated weigela is a hardy shrub, and it grows quickly and vigorously. That feature, combined with its pink blooms and green and gold leaves, make it a perfect fit along front and back borders. While variegated weigelas usually grow best in full sun, it’s also one of the better shrubs for shade, especially in particularly hot climates. You’ll want to plant these shrubs in spring in moist, well-drained soil because they’ll need water often the first 2-3 weeks and regularly after that. Fertilizer is a helpful aid, but not necessary. After the plant establishes itself, prune the shrub slightly after blooms have faded. This will help keep the plant clean and neat in your garden or lawn, and it will encourage new growth.